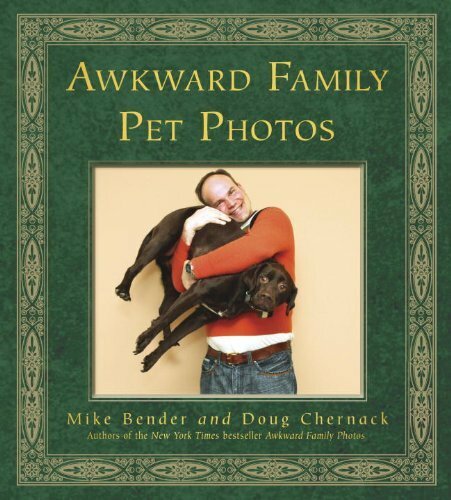 The authors of the New York Times bestseller Awkward Family Photos are back with a hilarious tribute to the unbreakable and sometimes uncomfortable bond between people and their pets. There are few things more rewarding than having a pet. They love us unconditionally, shower us with attention, and because of them, we actually live longer. So, what can possibly be awkward about our animal BFFs? Well . . . nothing. In fact, we’re the awkward ones. We adore our pets, but let’s face it—sometimes L-O-V-E makes us go a little overboard. Like giving them middle names, throwing them elaborate birthday parties, and making them a Christmas sweater to match with the rest of the family. Truth is, what they cherish most is our companionship. And maybe that’s the reason we care about them so much—because for such simple pleasures, they allow us to be as awkward as we want. Mike Bender is a screenwriter whose credits include “Not Another Teen Movie” and the MTV Movie Awards. He created the hit website AwkwardFamilyPhotos.com with childhood friend Doug Chernack in May 2009 after seeing an awkward vacation photo hung in his parent’s house. Doug Chernack is a professional screenwriter and producer living in Los Angeles who has created and produced shows for E!, Fox Sports, and The Golf Channel. THIS BOOK CURED MY HEADACHE. It also made me laugh uncontrollably. And, seriously, I did have a terrible headache when I started to read this one, but by the time I finished, I was laughing so hard that I completely forgot that my head hurt. The overall concept of the book is pretty simple, take some family photos from the earlier decades and pair them with funny captions. The majority of them really made me laugh and they even included some chickens with a family. For some reason, people taking pictures with their chickens (ok, there were a few roosters in there too), just seemed horribly funny to me at the time. There is a section devoted to birds, cats, dogs, farm animals and reptiles. Interspersed between the pictures are little essays from a vet and from the picture subjects explaining the photograph. This would make an excellent gift for any pet lover who has a skewed sense of humor. Contest is open to anyone over 13 years old with a US mailing address (sorry, no PO Boxes). This ends 11.17.11 midnight Pacific Time and the winner will be chosen by Random.org on 11.18.11. This giveaway is sponsored by Three Rivers Press for ONE WINNER. +1 you can social network this daily (twitter, blog, facebook) just leave me a link in the comments! I need a few good laughs, sounds like a fun book! This sounds wonderful! Thanks for the chance to win. I love any book to do with pets! Wow. This sounds wonderful. Count me in. Plenty of people on my gift list that have skewed senses of humor, just like me! Looks like a fun book! Thanks! I LOVED Awkward Family Photos! I wasn’t even aware of this sequel. Now I know what to get some of my relatives for Christmas! Thanks for the giveaway!! Yes, this is just the thing I need to share with my Labradors. Daily entry. Thanks for this giveaway! Daily entry 11/4! Thank you! Adorable! A laugh-inducing, headache-banishing book is just what I need these days. Daily Entry 11/7. Thank you Mary! Daily entry 11/9 Thanks Mary! Daily entry 11/11! Thank you! I think this book would be a great gift for my sister. Daily entry 11/14 Thank you Mary! I liked Awkward Family Pet Photos on facebook. twinkle at optonline dot net.